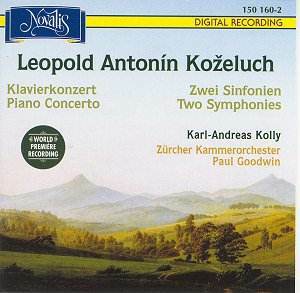 Leopold Antonin Ko�eluch, generally considered one of the better composers of the Classical period, was born in a section of Bohemia (now Czechoslovakia) about 20 miles north of Prague. He had at least sixteen siblings, and his father was a local cobbler. Although Ko�eluch began studying law in Prague, he eventually gave up his legal pursuits in favor of a career as a musician. He became famous throughout Europe for his pianistic abilities as well as his compositional skills. Unlike Mozart, Ko�eluch had a pleasant and secure personality, never having trouble getting musical positions and commissions; he also was an astute business man and founded his own publishing firm. He composed in all the popular forms of his time, creating approximately fifty piano sonatas, eighty piano trios, twenty concertos, and many symphonies. He also composed a number of religious works, all of them now lost except for the oratorio Moses in Egypt. Further, Ko�eluch composed a minimum of six operas, each of them currently lost to us. He tended to write in a Haydnesque manner, emulating the master. Haydn even performed many of Ko�eluch's orchestral works in London. Given this background, one might assume that his music has much to offer, but the assumption is not quite on target. The fact is that Ko�eluch's compositions are many rungs below the artistry of Franz Joseph Haydn. He was an imitator of the then-current styles, providing little harmonic adventure and even less musical inventiveness. Frankly, a typical Ko�eluch theme is entirely conventional and does not stick in one's memory. These impressions are evident in the three programmed works on the Novalis disc. The best music comes from the rousing and exciting outer movements that significantly mask the lack of varied emotional themes and memorable phrases. The slow middle movements are less engrossing, possessing neither the poignancy nor desired charm to offset the lack of inspiration. Particularly uninviting is the Andantino con variationi from the Piano Concerto in D major that has an attractive theme followed by nine variations which simply are not sufficiently varied. Any changes are cosmetic ones involving tempo and dynamics; the basic melody line is constant and leads to boredom well before the end of this nine-minute movement. In summary, the best I can give this Ko�eluch disc is a mild recommendation. Better alternatives include a Teldec disc of four Ko�eluch symphonies played by the period instrument group Concerto K�ln that performs with more panache and sharper phrasing than the Zurich Chamber Orchestra. Staying within the Novalis family, there is an exceptional disc of two piano concertos from the pen of Franz Xaver Mozart that I reviewed recently for MusicWeb International; these are wonderful concertos that are much more accomplished and inspired than the Ko�eluch D major Piano Concerto. For those still interested in this Novalis/Ko�eluch disc, rest assured that the sound quality is admirable though hardly of state-of-the-art.